Limited Edition miniatures are those that have been deliberately only released in a fixed quantity or over a short duration. The vast majority of them are incentives for pre-ordering products, celebrations of events or conventions, or prizes in ITS tournaments. Many of them have alternate sculpts, typically with head and arm swaps, which were made widely available and this is noted where appropriate. 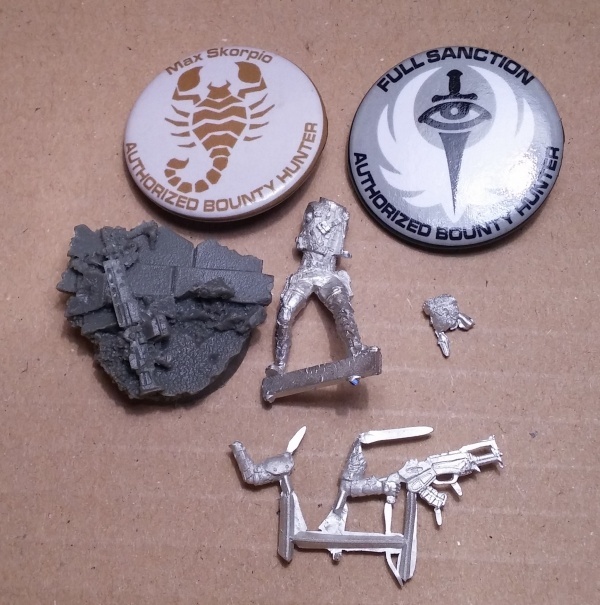 Ever since Campaign: Paradiso, there has been a freebie miniature given away as a pre-order bonus for buying books and army boxes. So far these have all been completely unique to their book and there have not been any alternate releases for any of these sculpts, so make sure to grab them when you can! Gogo Marlene (a stage-name, presumably?) was the first civilian (and first pre-order!) model released and was made available with Campaign Paradiso. Unfortunately her little robot doesn't have any of its own rules. She is commonly fielded as a WarCorrespondant or HVT. 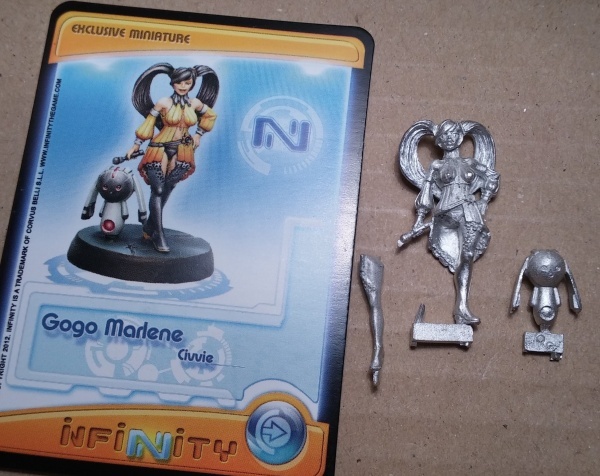 Miranda came with the first (and to date, only) concept art book released for Infinity and has her own unique set of rules. She is armed with a deadly monofilament sword and is a dangerous fighter, but is rarely fielded despite being available to many factions due to being Irregular. The CSU came out with early purchases of Operation: Icestorm and has a unique, if seldom used, profile in the rulebook. It's hypothesised that she represents the VIP Executive model that is available in the Haqqislam/PanOceania Dire Foes box - Flee or Die. 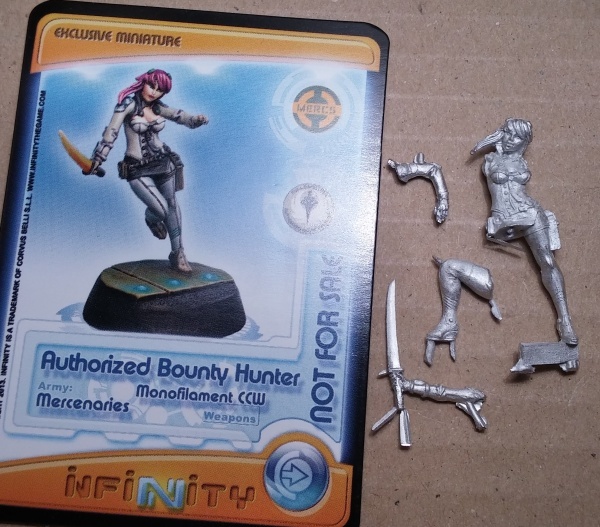 The Bounty Hunter which came with the 3rd edition rulebook represents a Booty roll of 'heavy armour' (+4 ARM). He carries a PanOceanic Boarding Shotgun. 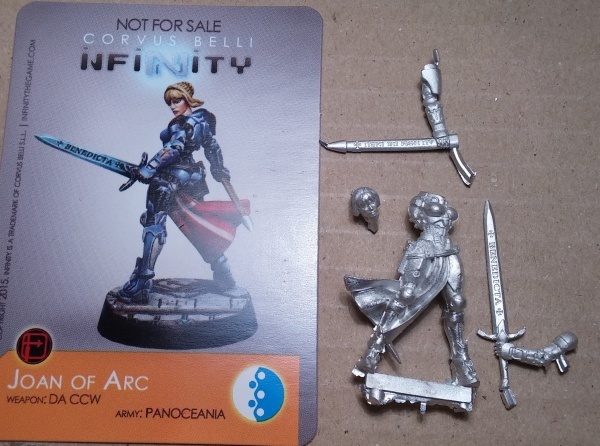 Joan was released when Corvus Belli decided to create a new model to promote Angel's first painting book but this technically isn't a pre-order bonus as one came with every copy of the book. The original print run had 5,500 copies, but it's unclear how many were made for the second printing. 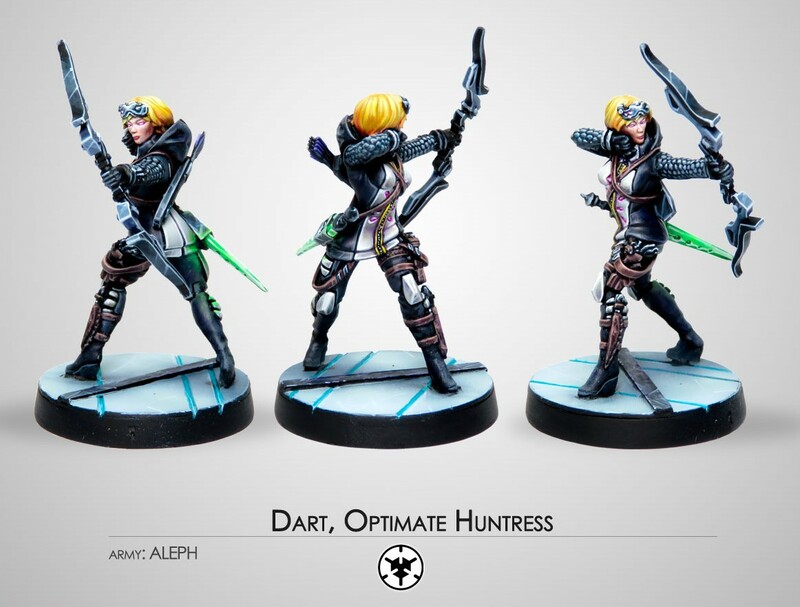 Due to her rather niche use (she's one of the few faction-specific limited models) and fairly widespread availability she's not particularly sought after. The dismounted Maverick came free with all early purchases of the USAriadna army box. She's the same character as the mounted Maverick, albeit with a bandanna instead of a helmet. 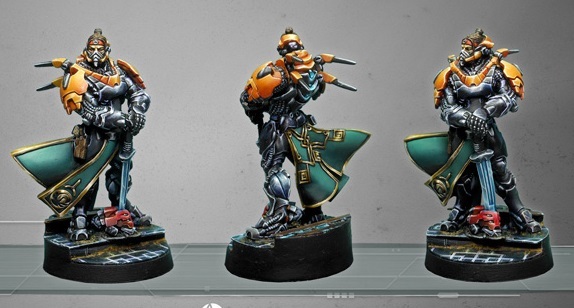 A very handy model to have as she can proxy for many other units in the faction. 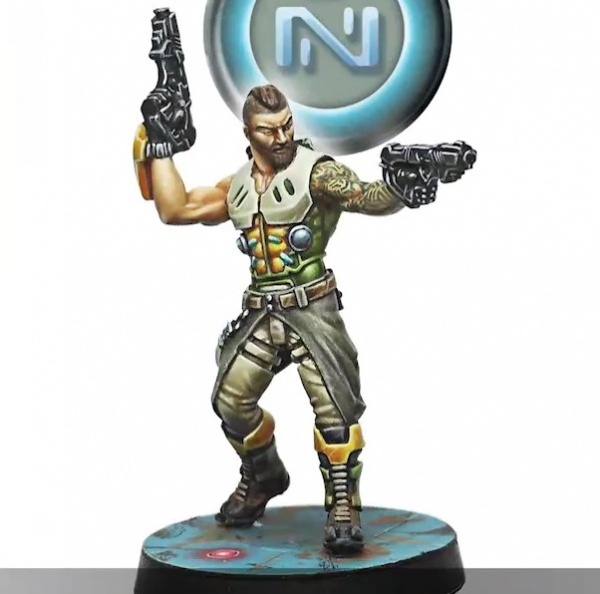 The Druze Hacker is a great looking model and was included with pre-orders of Human Sphere N3. 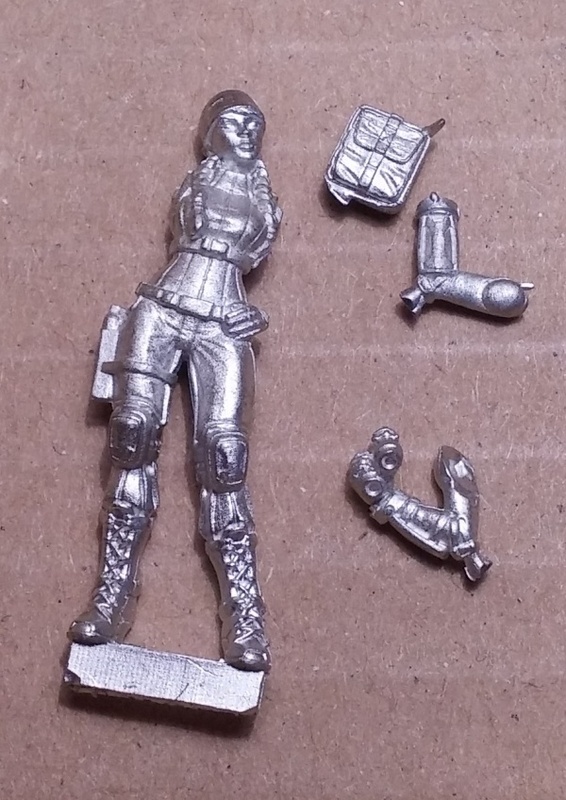 She's a popular choice for use as a Mercenary Wardriver in Ariadna or one of the ALIVE group and she carries a PanOceanic Combi Rifle. It's worth noting that his 'wings' match those of the Bashi Bazouks. Released with Angel's second book. Unlike Joan, the Crane Agent was only shipped with pre-orders of the book. 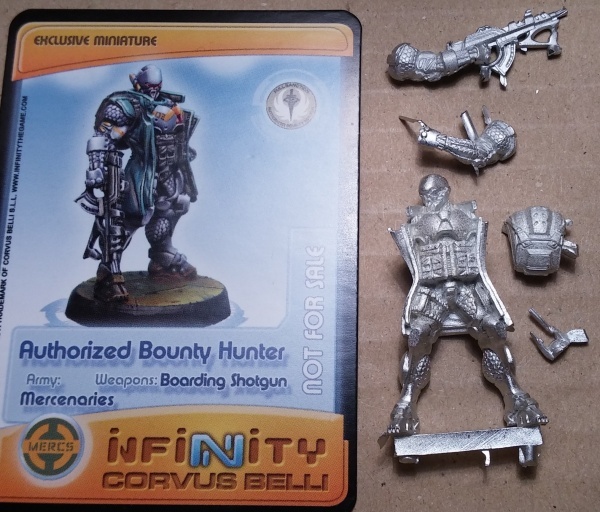 Luxumbra is a project to produce busts and 75mm miniatures based on Infinity. They O-Yoroi pilot is a 35mm version of the first 75mm miniature made. It was sculpted separately rather than being a scaled-down digital version. Knauf is one of the main characters in the Outrage manga and received his own mini for the book's pre-release. He is equipped with a mixture of equipment, much of it from PanO troops. 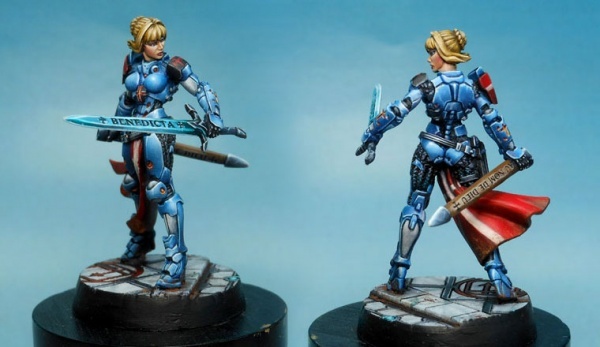 Available with Preorders of the Beyond Icestorm set. 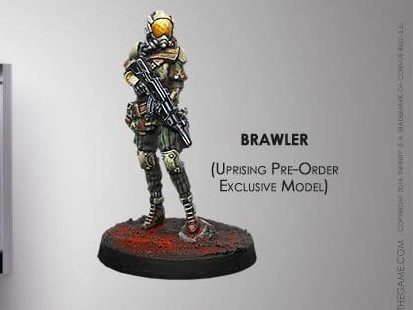 Available with Preorders of the Beyond Red Veil set. Available with Preorders of the Uprising book. 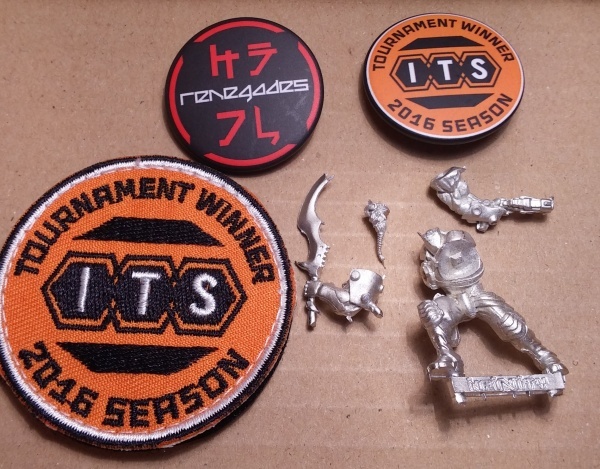 Each tournament season from 2013 onward contains at least one limited edition Infinity miniature. 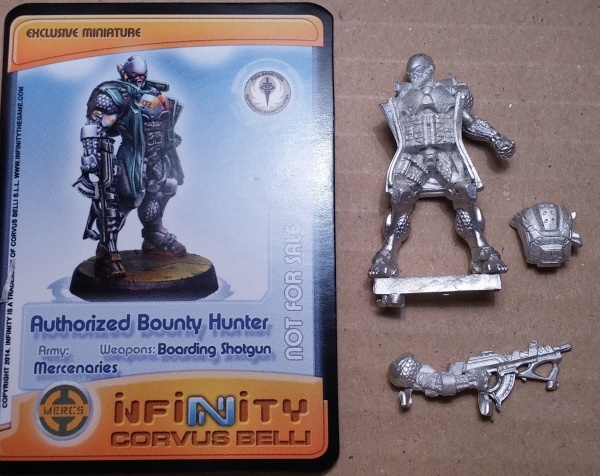 These packs are generally obtained directly via Corvus Belli or one of their distributors and the miniature is usually awarded to the tournament winner. 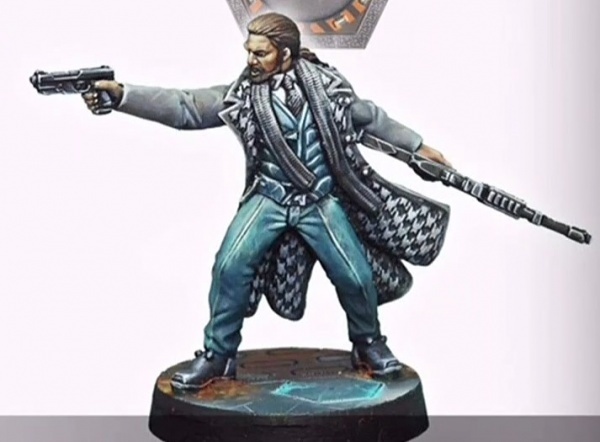 Despite being a named character Max Skorpio never had his own set of rules and, as such, he just ends up being used as a regular bounty hunter. 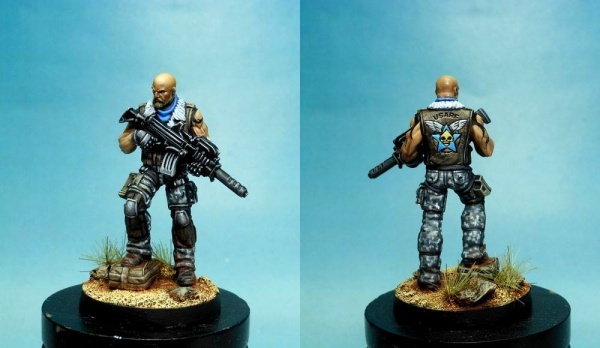 He carries a Nomad Heavy Machine Gun (although apparently some of the prize packs came with the Nomad Combi Rifle arms instead) and all Max Skorpio miniatures came with a random Micro Arts Studio 'Urban Fight' base. 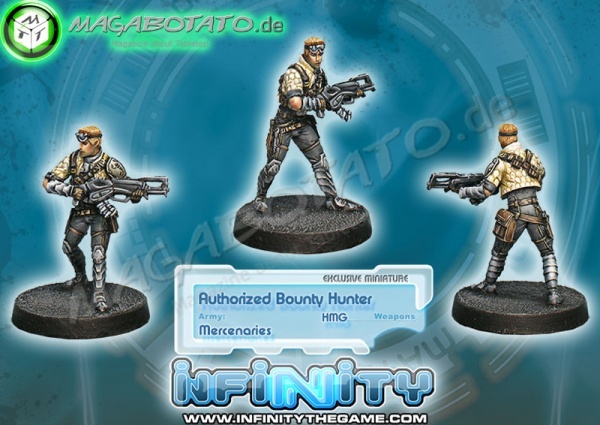 General Release Version: Generic Bounty Hunter with a masked face and Nomad Combi Rifle. 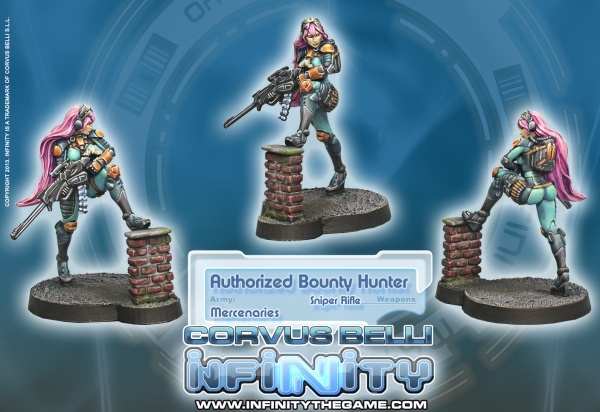 The bounty hunter sniper was not a named character and so doesn't have her own rules. 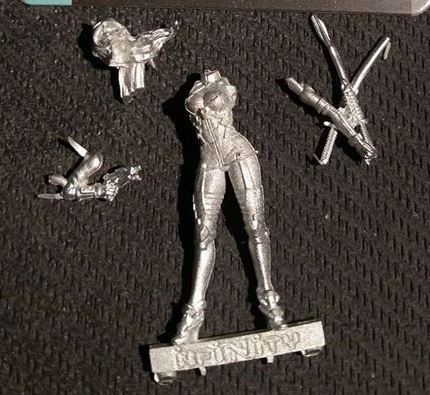 She also came with a random Micro Arts Studio 'urban fight' base just like Max Skorpio and is armed with a Nomad MULTI Sniper Rifle. General Release Version: Riding an Aleph bike with an alternate leg and armed with a PanOceanic Boarding Shotgun. Le Muet was the first tournament pack model to have his own set of particular rules and will work for all the vanilla factions. He's quite a powerful character and so is fairly sought after. 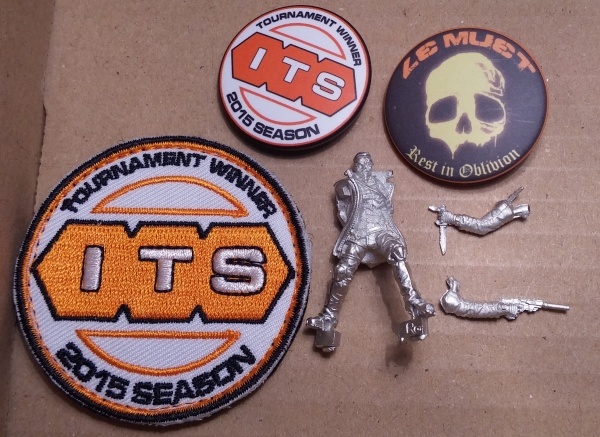 In 2015 the MAS resin base was replaced with an exclusive winner's patch. 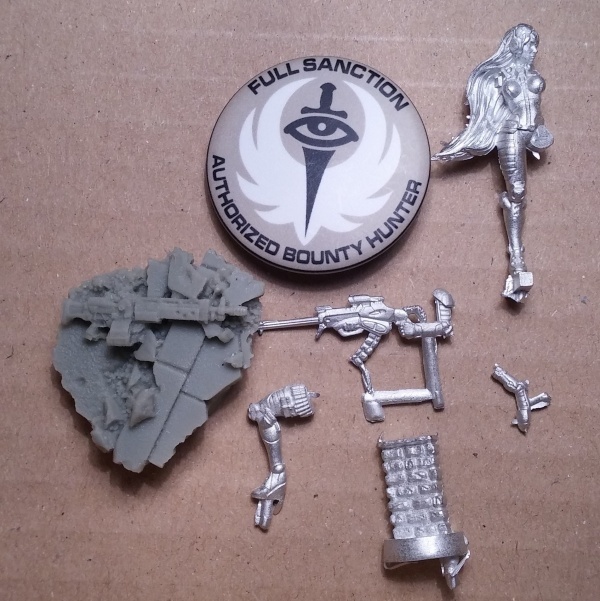 Some Le Muet packs also came with a special base top from Customeeple which was separately available from their webstore. 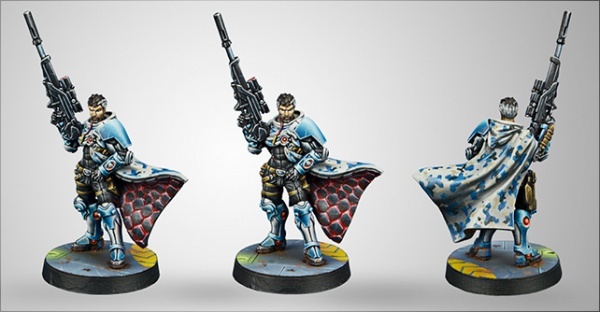 The Krakot Renegade is the tournament pack model that was available for the least amount of time due to the short 2016 season (beginning in February and ending in August). However, it may end up being more common than Max Skorpio or the Sniper as tournaments are much more common than they were in the earlier days. 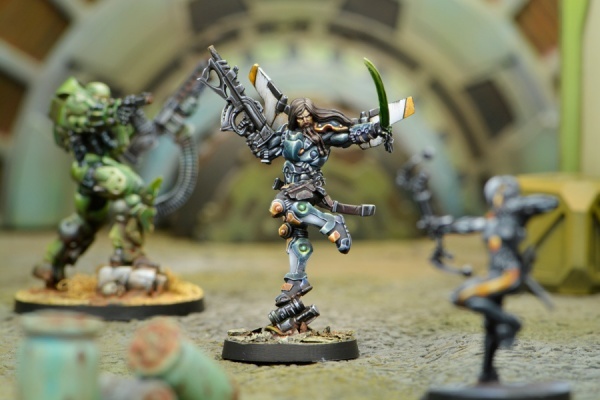 The Krakot is the second tournament pack model to have its own and rules and, unusually, has an AVA of 2 or more in all the vanilla factions and so is fairly sought after. General Release Version: Armed with two Submachine Guns. ITS Season 8 gave almost every faction access to Scarface and Cordelia for the duration of the season. Not only that but rules changes meant that pilots were made to be much more impactful. 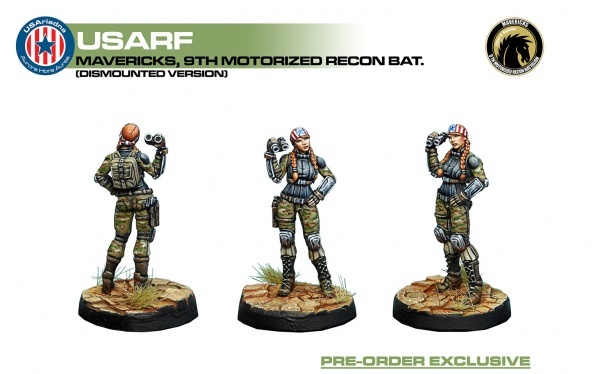 Scarface is always a popular character, although the value of this model is going to depend very heavily on whether his services remain available for hire by the majority of factions once ITS Season 8 has ended. General Release Version: Non-existent, although there is a Bootleg version which also involves him beating the snot out of some poor Combined Army dude. ITS Season 8 is also unusual in that Corvus Belli released a limited edition series of tournament packs featuring a series of linked narrative missions, a general-release Umbra Samaritan and a limited edition version of the Tikbalang. In this case, it represents Eduardo, Toni Macayana's personal TAG and it comes armed with a pair of brutal looking swords whereas the stock one has a gun held in the left hand. 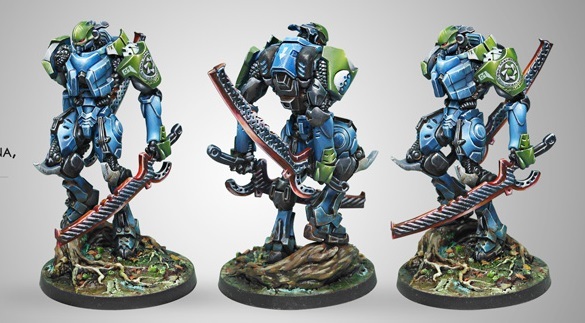 The model includes a shoulder pad with Toni's own insignia on it but otherwise is just a straight pair of arm swaps compared to the stock Tikbalang and even comes with the same scenic base. No special rules were released for it. Expect this miniature to be fairly valuable as it is rather limited in quantity - the TAGLINE packs themselves were only available for a handful of months. General Release Version: Sword over shoulder and gun in left hand. ITS Season 9 gives everyone access to a brand new type of mercenary troop - the Cube Jager, Mercenary Recoverer. ITS Season 10 gives everyone access to a brand new mercenary character - Aida Swanson. 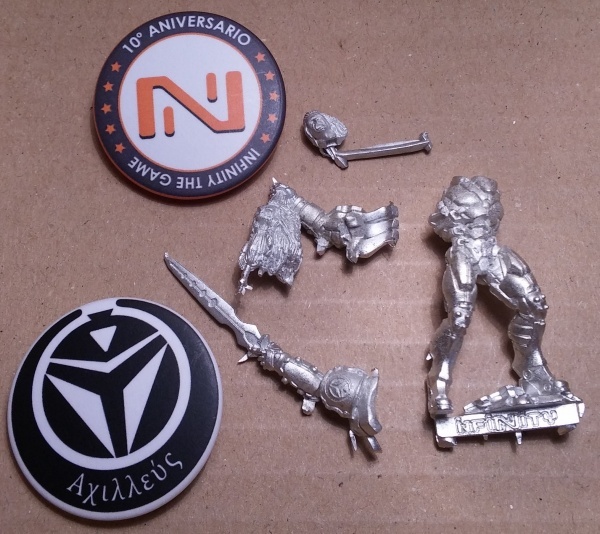 Occasionally miniatures are also produced for other reasons including convention seasons, promoting third party products, player rewards and just because Corvus Belli feel like it! 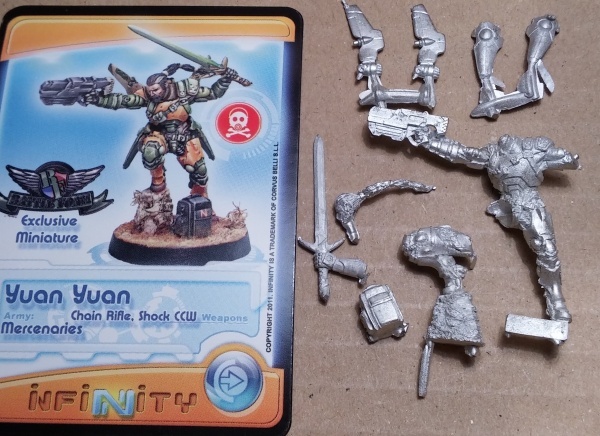 The Battlefoam Yuan Yuan is probably the rarest of all the limited editions. Please note that adorable little Battlefoam bag that comes with the miniature! 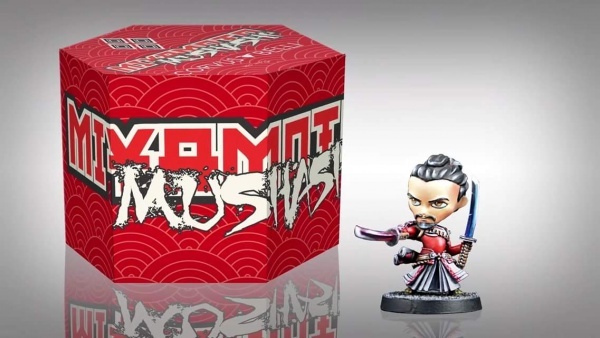 General Release Version: Two-pack with Sword and with Rifle. Each Warcor is given the option to buy three of these unique alternatives to the War Correspondent model each. Presumably these will become more common as more Warcors are inducted but for the time being they are fairly rare. It has a unique head, arms and leg modelled on the well-known player and contributor, Magno. General Release Version: Helmeted head, alternate arms and leg. 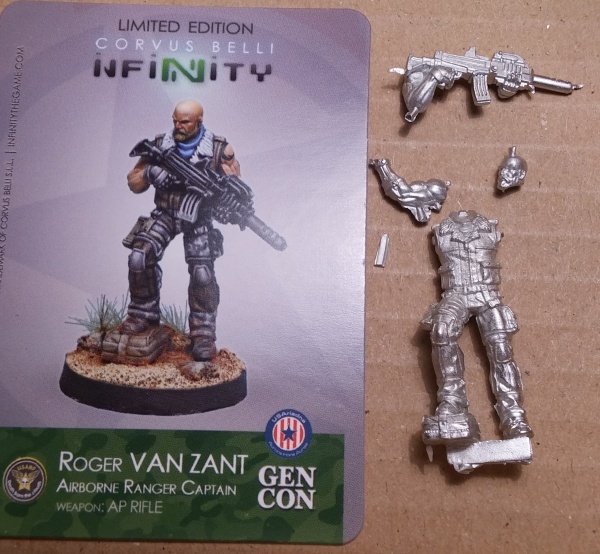 The Gencon version of Van Zant was made available at Gencon 2015 to promote the release of the USAriadna faction. 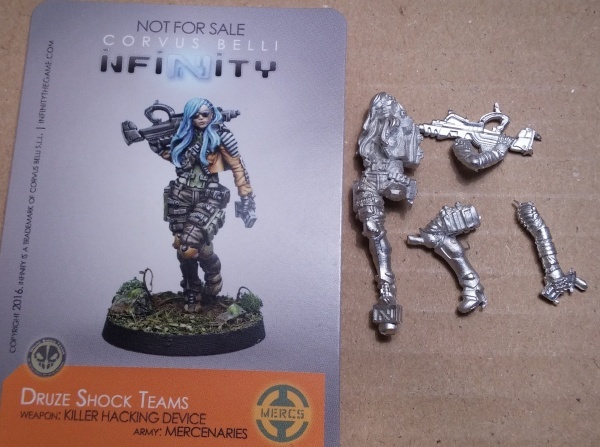 They were also available through direct order from Corvus Belli for a short while, although postage from Spain was considered to be rather pricy. General Release Version: Armed with a pistol and a whopping, great-big axe. 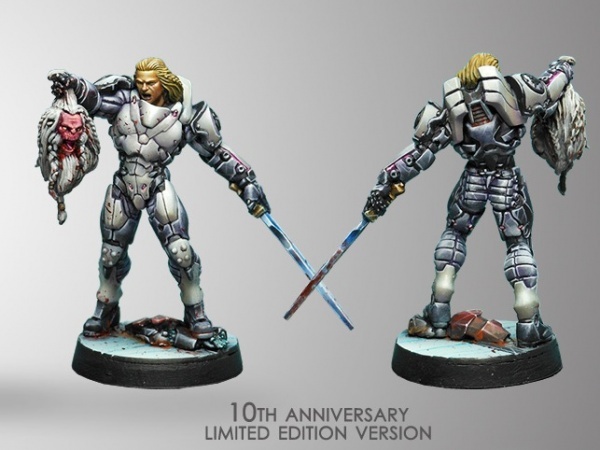 The Anniversary edition of Achilles was released in a double-pack with a non-limited version (due for separate release) to celebrate Infinity's 10th year. They were distributed to many stores and were available to purchase normally. It might not be very clear but he's holding a Morat's head. Gruesome! General Release Version: Armed with a MULTI Rifle. 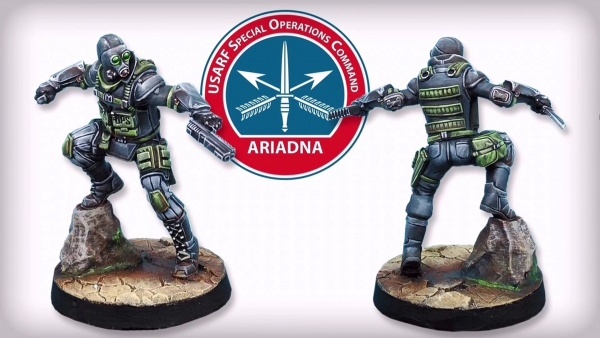 Much like Van Zant the year before, USAriadna received a further Gencon-only release. Once again they were available to order directly through Corvus Belli, international courier costs applying, and at the Interplanetary. General Release Version: Shield slung over the back and rifle in hand. 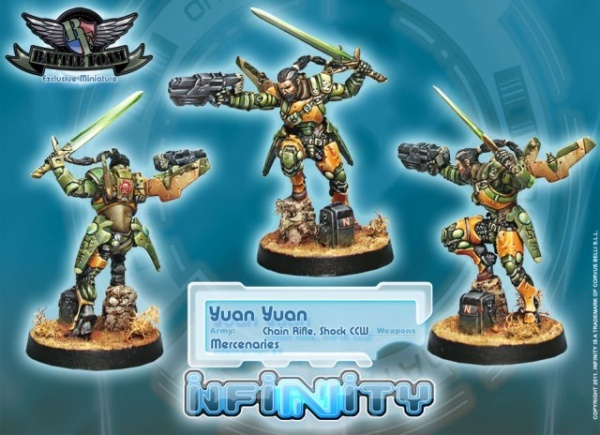 The Fat Yuan Yuan received two sculpts as part of its limited release after an extended campaign by players to have what was originally an April Fool's joke made real. Chibi Mushashi was a last minute, fun release which was partly in support of Aristeia. It was primarily released for Gencon. General Release Version: Several non-chibi versions! 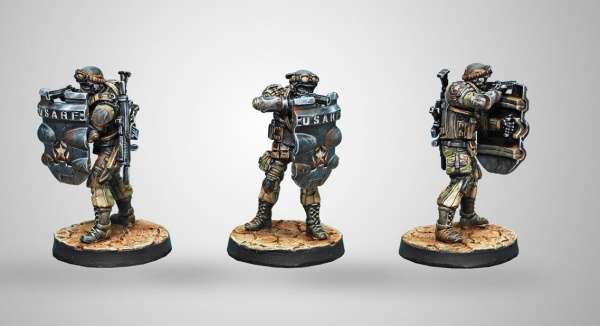 The Grunt version of the Spec Ops was released as a GenCon special. 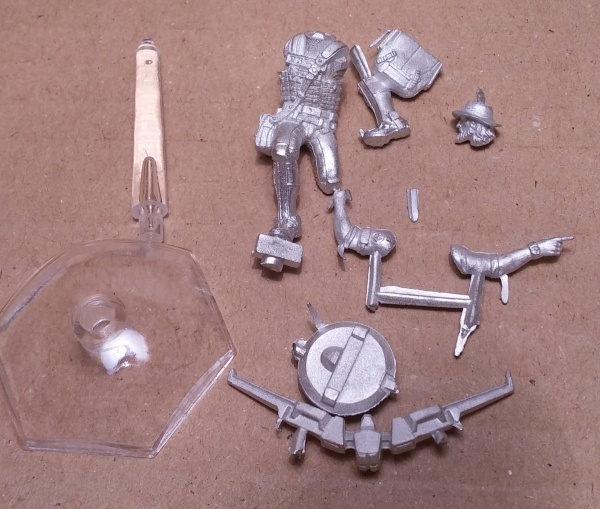 General Release Version: Head and weapon swap. General Release Version: None currently. The following six miniatures were each made available through the Kickstarter launched by Modiphius. 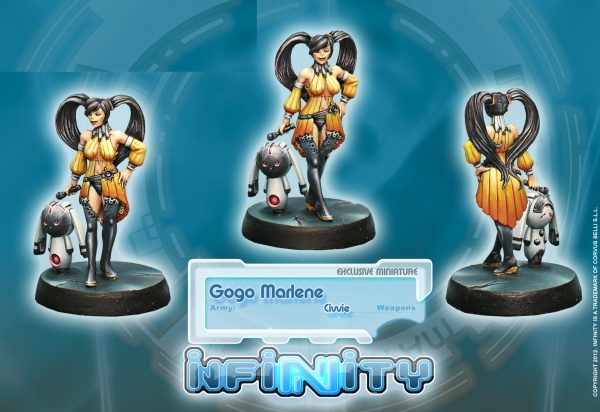 General Release Version: Each miniature has an alternate general release. This page was last modified on 3 November 2018, at 07:43.